For Bluetooth version of ELM327 interface: Connect ELM327 adapter to OBD-II diagnostic interface of the vehicle with ignition turned on and perform Bluetooth pairing of ELM327 adapter in Bluetooth settings of your Android device. If ELM327 adapter is named “OBDII” in the list of Bluetooth devices, then CVTz50 will be selecting this adapter automatically. If ELM327 adapter has different name, then this name should be set in CVTz50 options manually, otherwise CVTz50 will be asking to select adapter after each CVTz50 startup. For WiFi version of ELM327 interface: Connect ELM327 adapter to OBD-II diagnostic interface of the vehicle with ignition turned on and connect your Android device to WiFi network of ELM327 adapter. In CVTz50 menu, select “Use WiFi ELM327” and make sure that IP-address and port are the same as specified in user’s manual of the adapter. 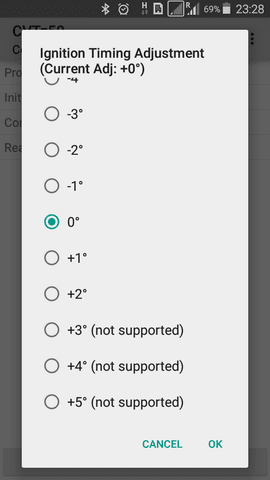 Some Android devices require turning on the option “Connect to WiFi network even if it doesn’t provide Internet connectivity”. 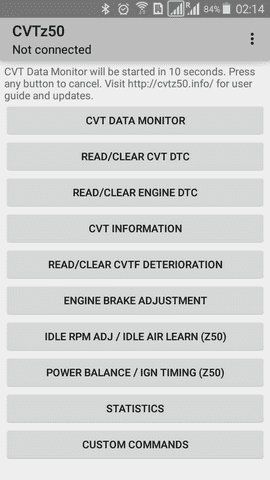 Start CVTz50 and verify the connection by pressing CVT Data Monitor button. If ELM327 connection established successfully, CVTz50 will show connection progress and enter data monitoring mode. To read Diagnostic Trouble Codes stored in CVT or in engine, press button Read/Clear CVT DTC or Read/Clear Engine DTC. After successful DTC reading, CVTz50 will show number of errors stored in corresponding control module and list of the codes. 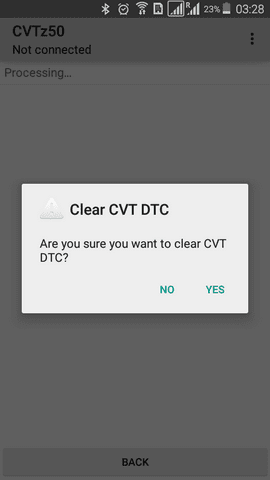 In order to erase CVT/engine DTC, press and hold corresponding button, then confirm erasing by selecting YES in confirmation dialog. Press Read/Clear CVTF Deterioration button to read deterioration data. Nissan recommends to change CVT fluid if deterioration exceeded 210000 points. 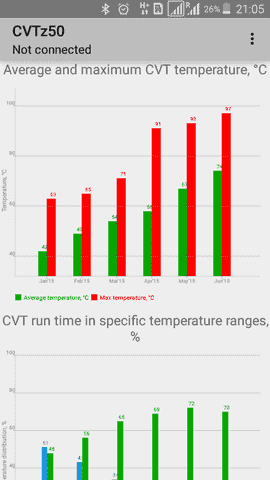 Note that on majority of the vehicles the deterioration counter takes into account CVT operation only in high temperature conditions (the counter increases only when CVT temperature is above 90°C). There might be other reasons to replace CVT fluid – they shall be considered even if deterioration counter is significantly below the threshold. 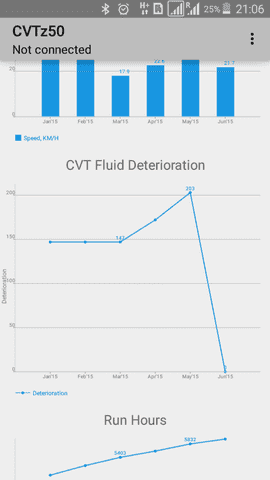 After replacing CVT fluid, CVTF Deterioration data should be cleared. To perform deterioration data erasing, hold Read/Clear CVTF Deterioration button and confirm the operation by selecting YES in confirmation dialog. Press Engine Brake Adjustment button to change the level of engine braking. 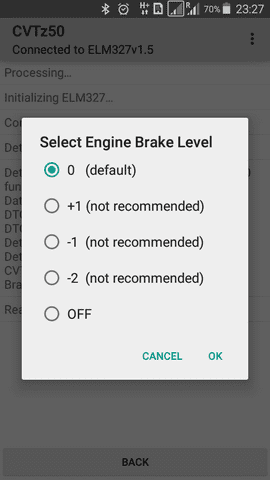 Current brake level will be retrieved from CVT control module and marked in the selection dialog. Select new brake level and confirm the change by pressing OK or press Cancel to exit without saving. Nissan is not recommending to select levels +1, -1 and -2. Nissan is not recommending to select levels +1, -1 and -2. Engine braking can be adjusted only on Nissan-based vehicles. Mitsubishi, Peugeot, Citroen, Jeep do not provide such ability in their CVT control firmware. Press CVT Data Monitor button to start realtime monitoring of CVT parameters. Data monitoring will be also started automatically if no buttons pressed within 10 seconds after CVTz50 launched. Vehicle speed, KM/H (corresponding Consult-II parameter: VEHICLE SPEED). Some vehicles may report here values less than real vehicle speed. For such cases, it is possible to manually select speed source: CVT speed sensor, ABS speed sensor, or speed recognized by engine control system. Speed source selection menu can be opened by long click on speed value in monitor mode. Timestamp of last monitoring data update. In case if DTC appear in engine control or CVT control, then timestamp will be replaced with DTC indicator – yellow in case of engine DTC and red in case of CVT DTC. Detailed description of these parameters can be found in official Electronic Service Manual for Nissan Murano. Data updates every 5-8 seconds when CVTz50 reads data from CVT control module, engine control module and AWD control module. Update frequency can be increased to 5-8 updates per second by turning off reading of engine and AWD in CVTz50 menu. Data chart showing last 200 values of specific CVT parameter can be opened by pressing parameter name or value in CVT Data Monitoring mode. 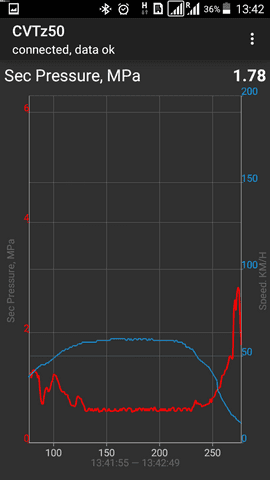 Red line is the selected parameter and blue line is Vehicle Speed. 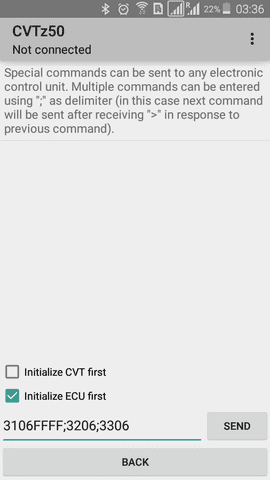 Change default Bluetooth adapter – setting adapter name that will be selected by CVTz50 automatically without need of manual adapter selection from the list. Bluetooth MAC address in format “12:34:56:78:9A:BC“ allowed here (if MAC address specified, CVTz50 will not show adapter selection dialog even if there is no paired device with such MAC address). Bluetooth Compat (*) – Bluetooth compatibility modes (different modes of Bluetooth security, speed). Compatibility settings should be used only in case of inability to setup Bluetooth connection or in case of Bluetooth connection instability. Use WiFi ELM327 – use WiFi variant of ELM327 adapter instead of Bluetooth. After selecting this option, additional dialog will be shown allowing to set adapter IP address and port. 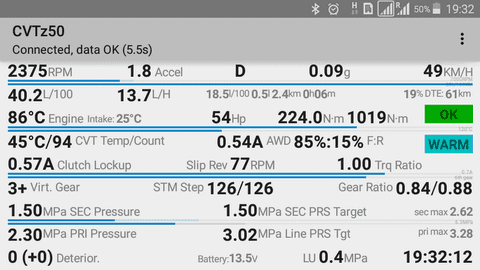 CVTz50 automatically tracks primary pulley pressure while vehicle stopped in D position after CVT fluid temperature reached 50°C and Step Motor got position 4. Under these conditions, primary pulley pressure should not drop below 0.5MPa. 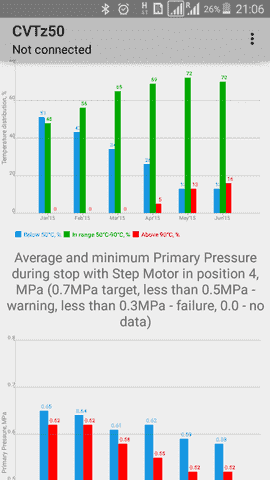 Once these conditions met, CVTz50 will display additional information block near Primary Pulley Pressure – Step4 %/min/avg showing percentage of Step Motor setting to 4 during continuous braking from 40km/h to 0km/h (more is better), minimum and average pressure during stop (closer to 0.7MPa is better). The block will be highlighted by yellow if minimum value drops below 0.5MPa; highlighted by red if drop below 0.3MPa. This automatic test is applicable only to CVTs equipped with Step Motor (prior to CVT7). During intensive acceleration from 0km/h (engine speed more than 3000 rpm), primary and secondary pulley pressure shall reach at least 5MPa. 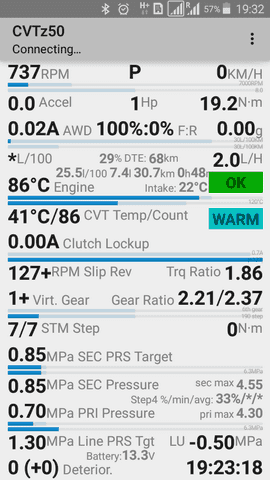 This test shall be performed in CVT-only monitoring mode (monitoring of engine and AWD turned off in CVTz50 menu) to ensure enough measurement sampling rate. Maximum primary and secondary pressures will be shown in fields sec max and pri max. Note: maximum values can be reset only by exiting CVTz50 so cvtz50 should be restarted before each attempt. In CVT-only monitoring mode (monitoring of engine and AWD turned off in CVTz50 menu) if accelerator pedal fully depressed, CVTz50 automatically measures acceleration time 0-50km/h, 0-100km/h, 0-150km/h, 0-200km/h. Measurement result will be shown near indication of gear lever position. Measurement accuracy is around 0.25s if data updated 4 times per second. 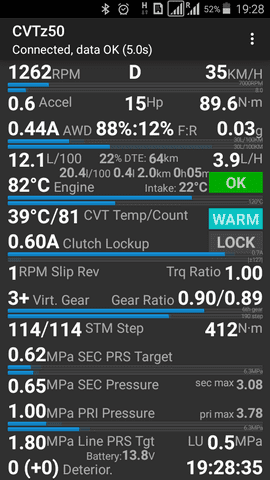 During monitoring, CVTz50 collects statistics on CVT temperature conditions, pressures, milage, fluid deterioration, engine runtime and other data. 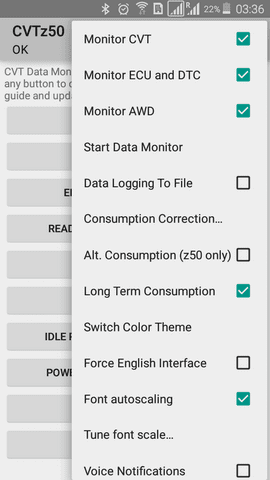 Statistics button opens new window showing graphical representation of collected statistical data which can be checked for any trends (like month-by-month pressure decrease illustrating fast CVT wear). Backup copy of statistical data is stored in Google account (if Android device is linked with Google account and applications data backup was not turned off during Android device setup) and will be restored in case of CVTz50 re-installation or during migration to new Android device using same Google account (if during migration to new device user allow “restore applications and their data from previous device”). 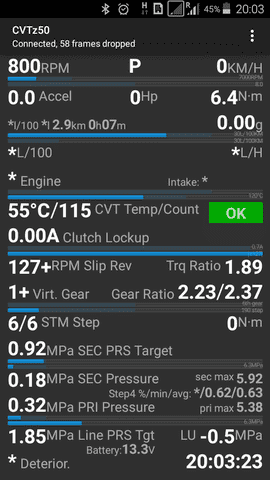 Run hours – engine run hours counted by TCM. 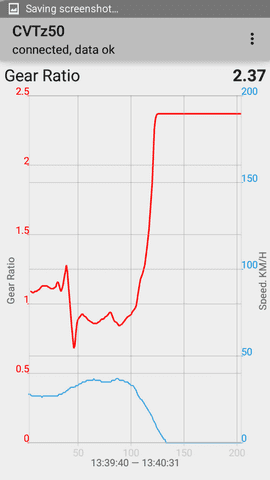 Rounded up to 10-minute intervals during each engine start. Counter resets when erasing TCM EEPROM (e.g. during TCM firmware update or TCM replacement). Counter stops increasing after reaching 10922 hours. 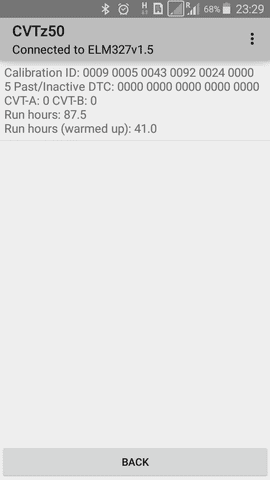 Run hours (warm engine) –run hours of warmed up engine. Counter stops increasing after previous counter reached 10922 hours. Idle Rpm Adjustment can be started by short pressing of button Idle Rpm Adj / Idle Air Learn (Nissan). Ignition Timing adjustment can be started by long pressing of button Power Balance / Ign Timing (Nissan). After starting an adjustment, CVTz50 reads current adjustment levels from engine control module and mark it in adjustment selection window. Press OK to save newly selected adjustment value to engine control module or press Cancel to quit without saving. Adjustments can be performed only on warmed up engine. Idle Air Volume Learning might be required before performing these adjustments. Long pressing of Idle Rpm Adj / Idle Air Learn (Nissan) button initiates the learning procedure. Learning should be performed on warmed up engine, all electronic load need to be switched off. Idle Rpm Adjustment and Ignition Timing adjustment need to be set to 0 before starting this procedure. Power Balance dialog allows to temporary disable fuel injection in specific cylinder. 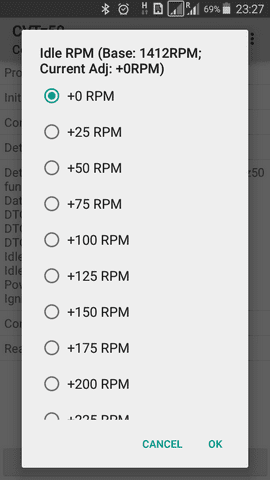 Dialog title shows current engine RPM and minimum RPM observed after last switching of cylinders. This test allows to compare performance among cylinders. CVTz50 allows to send any custom commands or command series to ELM327 or to any vehicle control unit. CVTz50 optionally can connect to CVT control module or to engine control module before executing entered custom command. Log containing main data exchange between CVTz50 and ELM327 adapter is stored in file cvtz50.txt which can be found on memory card of Android device. 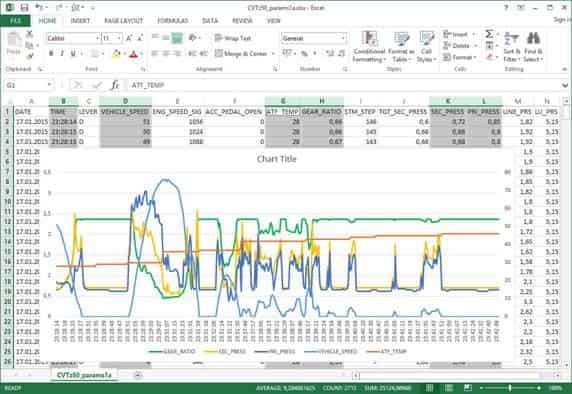 CVT realtime parameters recorded during monitoring are stored in file cvtz50_params.txt which can be opened by Microsoft Excel for detailed offline analysis. In engine-only monitoring mode, engine realtime parameters are stored in logfile cvtz50_engine.txt. Q: Is tehre iOS or Windows Mobile version of CVTz50? A: Windows Mobile will not be supported. iOS version will be released in the future, however detailed schedule is not available yet. Q: What does specific DTC mean? What is the meaning of specific CVT parameter? A: Most reliable information can be found in Electronic Service manual for specific vehicle which also describe potential causes for major DTCs and corresponding diagnostic and recovery procedures. Q: Why Primary Pressure is always 0 and Step4 test does not show this pressure while other parameters displayed correctly?